Logo’d Gear is a premier provider of Cutter & Buck apparel. Appeal not only to the discriminating taste, but to shoppers who are looking for social responsibility in a company they do business with. Logo’d Gear and Cutter & Buck believe in providing customers with superior value, employees with a superior work environment, and our community with superior business practices. Logo’d Gear seeks out responsible suppliers and vendors who share our values and provide quality products in a sustainable, environmentally-friendly way. From corporate and team wear, to stylish casual clothing for sports and recreation, the discerning customer can find the best that money can buy at Cutter & Buck. Classic styles are combined with the best modern fabrics and contemporary accents to please every taste. Our polo shirts feature the attention to detail that shoppers have come to expect from us. From men of smaller stature to men over 6'4", from the slender to the broad-chested, our proportioned sizes provide an excellent fit. Our women's polo shirts are cut to flatter the figure, with subtle styling differences to give a more feminine feel. Both our short-sleeve and sleeveless styles are made to move with you and keep their shape. Our ANNIKA collection, inspired by golfer Annika Sorenstam, offer the ultimate in sophistication. Cutter & Buck polo shirts are made with the finest quick-dry and moisture-wicking fabrics to keep you cool, dry, and comfortable. Or fabrics include lustrous mercerized jersey, enzyme-washed and combed cotton piqué, and rich jacquard weave. Our Signature Collection offers the classic cut of a polo shirt combined with our most luxurious fabrics. 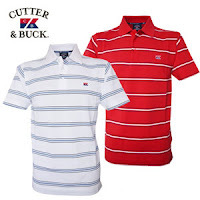 Cutter & Buck shirts feature the distinctive embroidered C&B logo; the emblem of quality and good taste. Embroidered logos are available to show your support for your favorite Major League Baseball, National Football League, collegiate team or corporate logo. Since Cutter & Buck was founded in 1990, they have become a premier provider of corporate apparel. Logo’d Gear is your one source for all Cutter & Buck apparel. Whether it's for your own wardrobe, as a gift, as a sports uniform, or for corporate wear, these polo shirts are sure to please.